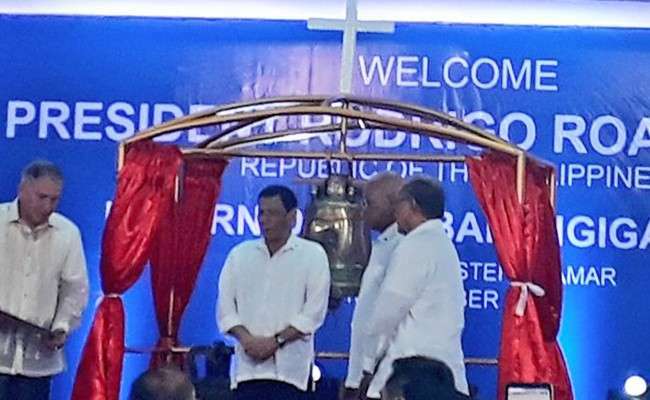 BALANGIGA, Eastern Samar -- President Rodrigo Duterte on Saturday, December 15, led the ceremonial turnover of three historic bells here at the Balangiga auditorium, which is in in front of the San Lorenzeno de Martir church where the bells originally belonged. Duterte, who arrived in Balangiga around 5 p.m., was welcomed by local residents who wanted to witness the formal turnover of the Balangiga bells taken by American troops in 1901 as war booty during the Philippine-American war. He turned over the Balangiga bells to local officials but did not attend the Catholic mass. During the turnover rites, the President received the transfer certificate of the Balangiga bells from United States (US) Deputy Chief of Mission John Law. Duterte then handed over the transfer certificate to Balangiga Mayor Randy Graza, and San Lorenzo de Martir Parish priest Serafin Tybaco. More than a year after Duterte's demand, the Balangiga bells landed at Villamor Air Base in Pasay City on Tuesday, December 11 for a hand-over ceremony. Duterte skipped the hand-over rites in Pasay City and was instead represented by Defense Secretary Delfin Lorenzana. On Friday, December 14, the three bells taken by the US over a century ago were brought back to their original home, the Church of San Lorenzeno de Martir in Balangiga town. For Nemecio Duran, great grandson of Vicente Candelosas who tolled the bells in Balangiga during the Filipino-American war, the repatriation of the bells would be considered as the Philippines's victory. Duran also believed that the Philippines's relationship with the US, its long-time ally, “deepened” following the return of the historic bells. “We finally won the battle. The battle was a big bang. This is a bigger bang,” Duran said in a chance interview with reporters. “Without Vicente Candelosas, the bell would have not rang... This [latest development] is a deepening relationship between the United States and the Philippines,” he added. Speaking to reporters, Foreign Affairs Undersecretary Ernesto Abella said the return of the bells by the US was a historic moment for the country. “It is a moment of significance, especially for the Filipino people. Ang laking bagay para sa atin. Hindi lang siya politika (It's a big deal for us. This is not about politics). It is a truly historic moment for us and the people,” Abella said. “It's been for some time, but the President said it is the work of all of the Filipino people. Hindi mangyayari ito kung wala 'yung ating pagnanasa [It would not have happened without our] desire to have our dignity as a people restored, strengthened and uplifted,” he added. “We know what happened to these bells. For over a century, Balangiga was always hoping that one day these bells will be returned. This is finally a reality,” the Balangiga mayor said. “Naibalik na ang mga kampana ng Balangiga (The Balangiga bells have been returned) because of good will... May these bells remind us always that unity of purpose can be achieved,” he added. “We will return the bells to their original purpose and care for and cherish them. 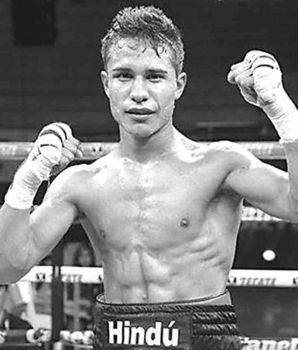 Rightly used, the bells call us to pray and worship God,” Varquez said. Law said the return of bells highlights the “enduring” friendship between the US and the Philippines.